Sewing machines have come a long way from their earliest models. Most modern sewing machines are capable of sewing thousands of different stitch types, all thanks to computerization. Computers inside the sewing machines can guide the needle to make almost any shape or pattern imaginable. Stitches are generally indicated by icons that look like the patterns made by each stitch. Whether your machine is basic or deluxe, vintage or modern, learning how to use a variety of stitches will increase your sewing skill and efficiency. The straight stitch, or lock stitch is the most basic stitch, typically standard on any machine. The stitches are straight, and there is a single line of thread. The machine typically uses two sets of thread to make the stitch--one from the bottom bobbin and one from the top thread spool, which makes the stitch stronger than if it was made by hand. The chain stitch is a type of stitch that is usually used to sew hems or decorative stitches. It differs from the straight stitch in that the stitches are linked together in a “chain” pattern across the fabric. Embroidery stitches are decorative stitches made from chain stitching. Most modern sewing machines have several different embroidery patterns already entered into the machine’s computer. Some machines even have the option of designing your own embroidery pattern and uploading it into the machine. Embroidery stitches can come in circles, flowers, stars, triangles, squares, letters and thousands of other combinations. The buttonhole stitch makes many sewer’s lives much easier. The buttonhole stitch is a setting on many sewing machines that automatically stitches around a hole inside fabric to seal the edges for buttons. The serge stitch is also known as the overcast stitch or whip stitch. 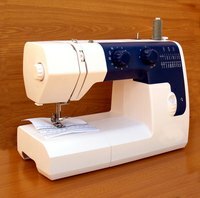 The serge stitch is usually applied to the edges of fabric using a serger sewing machine. The serger uses a stitch similar to crochet to bind the edges of the fabric so that they cannot fray, according to Sergers.com. Most professionally sewn seams are serged. The basting stitch is a sewing stitch that uses long stitches to hold fabric together temporarily. Usually this is done by hand, but when a machine does it, it is much faster, according to My Simple Sewing Patterns. The basting stitch is used to hold slippery materials together so they can be sewn at a later date. The blanket stitch is used to sew edges of blankets and other fabrics. Half of the stitch is present inside the fabric, but the other half runs along the very edge of the fabric in a looping pattern. The blind hem is a type of hemming that hides the thread behind the outside edge of the fabric so that the hem is invisible. This uses a series of stitches that are much smaller in the front than they are in the back. This stitch is standard on most machines, though a special foot is necessary to properly execute a blind hem. The darning stitch sews a criss-cross pattern of stitches across a hole or tear in a fabric simulating the weave pattern originally used to make the cloth. The zigzag stitch weaves a zigzag pattern over the material. This stitch is often used to sew stretch fabrics, according to Singer, as well as for applique edges and decorative stitching. Most machines include a setting for this stitch.